The University and College Union (UCU) has announced today that industrial action over the current pension dispute for university staff will cease immediately at higher education institutions across the country. The union’s decision followed a ballot of UCU members, the results of which were announced today, which saw a majority of 64% of members accept proposals put forward by employer advocacy group Universities UK (UUK) last month. The vote saw a record turnout of 63.5% of UCU members. The UUK proposals included the introduction of an expert panel to assess any future transition to ‘defined contribution’ pension funds, which UCU members have staunchly opposed. The proposals also called for the panel to evaluate current and future valuations of the Universities Superannuation Scheme (USS), the pension scheme for university staff. An earlier estimate of the USS’ deficit was the catalyst for the UUK’s initial proposed changes to the current pensions structure. How much ground has UUK conceded from its original proposals? UCU General Secretary Sally Hunt called on members last week to vote in favour of the current proposals, noting that the concessions “put the union in a very strong position to resist cuts to our pensions”. University staff voting against the suspension of strike action differed on what they viewed the union’s next steps should be, with some advocating for the inclusion of a ‘no detriment’ clause, in which any increased contributions required to maintain the existing benefit structure would be funded entirely by employers. 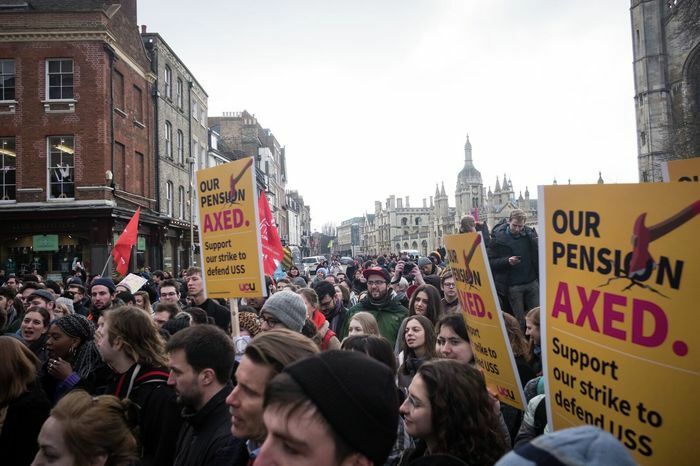 While the statement by the Cambridge UCU Executive Committee on Wednesday recommended that members vote ‘no’ on the ballot, it argued that a national rejection of the proposals “should not be taken as a mandate for a ‘no detriment’ negotiating position”. The Cambridge UCU Executive Committee clarified that their position against the current proposals was “in the spirit of ‘revise and resubmit’”, therefore rejecting the current proposals as being insubstantial, while not necessarily taking the hardline approach on employer negotiations of the ‘no detriment’ platform. In the member consultation on the #USSstrike ballot, 64% of members who voted voted to accept the proposals on a record 63.5% turnout. All strikes are suspended. Message has gone to members. More on https://t.co/DjyFmHIKhv shortly. However, Hunt did not distinguish between the two camps in her open letter to members last week, in which she said that if members voted against the proposals, then the union would prepare for further strike action, in a push for the inclusion of a ‘no detriment’ clause. Hunt has openly criticised the ‘no detriment’ strategy, arguing that “none” of the vice-chancellors whom she has spoken to “have been prepared to discuss a ‘no detriment’ agreement”. The UCU ballot was not initially conceived as providing the deciding factor for future strike action, but was a condition announced in Hunt’s open letter following a UUK statement that employers’ support for the proposals was “conditional on the suspension of strike action”. The organisation of the UCU ballot faced early scrutiny by branch members last month, as the initial uncertainty on whether the acceptance of UUK proposals would halt strike action left members feeling that “they no longer had the mandate to vote either way on the fitness of the proposal to be put to ballot”, according to Cambridge UCU vice-president Dr. Sam James. The national union previously faced backlash from members in late February, when an agreement reached jointly with UUK in national-level negotiations was soundly rejected by branch members. Cambridge Defend Education (CDE) released a statement last week in support of staff voting to reject the UUK deal, saying that they will continue to support striking staff “for as long as they are willing to do so”, arguing that “the deal on the table is not good enough”, given previous cuts to staffs’ pensions over the last decade. The effect of past strike action on the content of summer examinations remains unclear, as the University of Cambridge has said that heads of faculty will decide on any changes to examination length, and on whether to remove certain concepts not covered due to lecturers having gone on strike. However, the Office for Students, a new government watchdog for higher education, has issued guidance that academic standards should not be lowered for examinations whose courses have been incompletely taught due to strike action, over fears of grade inflation.